A rhino was killed mercilessly outside Kaziranga National Park. 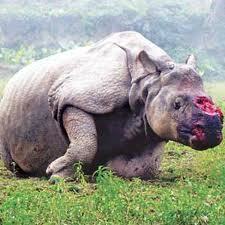 Besides its horn, the poachers took away the animal’s bones and flesh. This is the fourth rhino killed in the only World Heritage Site of Assam, India this year. Last year, five rhinos were killed inside the same park. At Corbett National Park of the Dhikala forst range, forest officials also recovered a tusker’s carcass recently. There are controversies regarding the death of the elephant, as the forest officials are claiming that the tusker died a natural death. At the same national park, a baby elephant was also found in a seriously injured state. Same way, the tigers are being killed by poachers and their body parts smuggled to China and Tibet, and all over the world. Apparently, the government is not doing enough to protect these majestic animals, who belong to this planet as much as we do. These rampant brutal killings of our lower cousins need to stop immediately. The government needs to take stringent measures for the safety of these animals. The forest guards need to be equipped with modern gadgets and weapons for surveillance and safety of animals. The people living in the areas close to these national parks need to be taught about the importance of how the existence of these animals is necessary for our eco-system and our Earth. This mindless violence needs to stop immediately if we want carry on living on this planet.